26th July 1856, 33 Synge Street, Dublin, Ireland. George Bernard Shaw was the son of George Carr Shaw a corn trader and alcoholic and Lucille Bessie Gurley an amateur singer and teacher. Had two elder sisters, Lucille Frances (Lucy) a singer and Elinor Agnes (Yuppy). Wesleyan Connexional School but claimed to be self-educated. His father had no money to send him to university. 1865: The family set up house with the Dublin concert Promoter George John Vandeleur Lee. 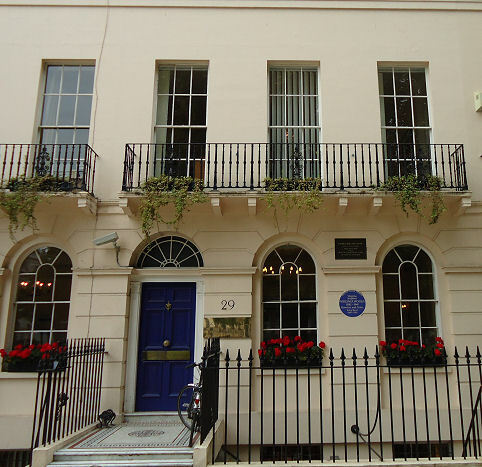 1873: Lee Moved to London and Shaw’s mother and sisters followed him leaving him alone with his father. Got a job in Dublin working as a clerk for a firm of Land Agents. 1876: Sister Elinor dies of Tuberculosis at the age of 21. Moves to London and is supported by his mother whilst he tries to establish himself as a writer. Writes five novels all of which are rejected by London publishers. Contributed articles to the “Pall Mall Gazette”. 1879: George Bernard Shaw finds employment with the Edison Telephone Company. Learns shorthand and begins studying several foreign languages as well as boxing. Becomes a Councillor for the London Borough of St. Pancras. 1881: Shaw becomes a vegetarian in an attempt to stop his severe migraine attacks. 1882: Heard Henry George lecture on land nationalisation and he joined the Social Democratic Federation later becoming friends with such people as William Morris. 1884: Joins the Fabian Society (named after a Roman General who advocated harassment rather than all out war) where he joined with Sidney Webb in trying to establish Socialism as a credible doctrine. He became an ardent and well respected speaker at public functions over the next few years. Given the job as Art Critic for the “World” magazine. 1888: Shaw became music critic for the “Star” newspaper under the pen name of “Corno di Bassetto” where he achieved considerable fame. He also became a drama critic for the “Saturday Review”. 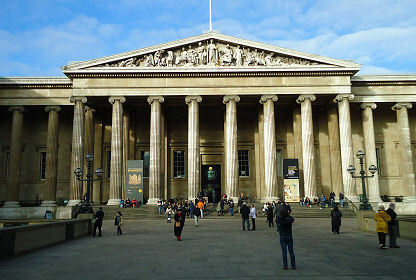 Met Karl Marx’s daughter Elinor and was to be profoundly influenced by “Das Kapital” which he had read in the reading Room of the British Museum. 1890: Shaw gives a lecture on Ibsen to the Fabian Society. 1892: Her is asked to write a play after arranging for a private production of Ibsen’s “Ghosts”. “Widower’s Houses” was the result. Most of his plays were published at his own expense in reading editions. 1893: Shaw attended a Fabian Society conference at Bradford which saw the creation of the Independent Labour Party (later to become the Labour Party). 1897: “The Devils Disciple” was produced in New York as it was deemed unsuitable for the London Stage. 1902: Publication of “Man and Superman” one of his finest philosophical works. 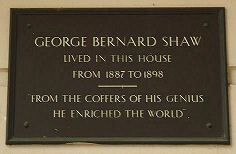 1903: George Bernard Shaw ceases to be a local Councillor. 1914-18: His “Commonsense about War” was controversial and he lost popularity during the First world War as the public mood was for something a bit more light hearted. 1923: Approached by the millionaire and founder of Birmingham Repertory Theatre Sir Barry Jackson who wanted to stage the first production of “Back to Methuselah”. 1925: Shaw awarded the Nobel Prize for Literature. 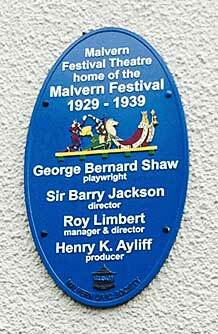 1929: Jackson set up the Malvern Festival with the first season being entirely devoted to the plays of Shaw. 1931: Visits the Soviet Union. 1932: George Bernard Shaw made a world tour accompanied by his wife. 1938: A film version of “Pygmalion” was produced although he would not allow any cuts to the dialogue. 1945: “Caesar and Cleopatra” filmed. 1889: “Fabian Essays in Socialism”. 1891: “The Quintessence of Ibsenism”. 1894: “Arms and the Man”. 1897: “Candia”. “The Devil’s Disciple”. “The Man of Destiny”. 1902: “Three Plays for Puritans”. 1905: “Major Barbara”. “Man and Superman”. 1928: “The Intelligent Woman’s Guide to Socialism”. 1932: “Too Good to be True”. 1939: “In Good King Charles’s Golden Days”. 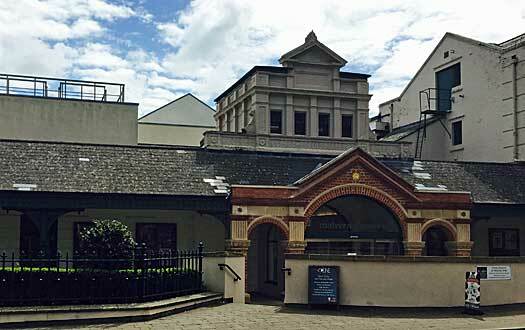 1898 to Charlotte Payne Townshend a wealthy Irish protestant at Covent Garden Register Office, London. (Died 1943). 2nd November 1950, Ayot St. Lawrence, Hertfordshire, England, after an accident pruning an apple tree. Ashes scattered in his garden at Shaw’s Corner, Ayot St. Lawrence, Hertfordshire, England. Shaw’s Corner, Ayot St. Lawrence, the house where he lived with his wife for 44 years. The British Library, Reading Room. Shaw Society, C/O AJL Gayle, 5A The Lane, Blackheath Park, London, S23 9SL.